More Morocco memories – including the endless servings of food at a riad in Marrakech. After around the fourth course I asked one of our lovely waiters ‘if that was it’ – are we done – he said yes. Two minutes later he’s back with more dishes and plates filled with food, and fresh knives and forks…this seemed to go on all night. Great if you’re a big eater. The 10 plates served for the starter were enough to fill me up. Be warned, if you’re hungry, don’t eat too much too soon – you need to pace yourself for all the courses. You only know the meal is over when the fruit comes, I’ve cottoned on that fruit signals the end of a meal in Morocco. Even after a heavy pastry dessert, they still bring out some fruit – thinly sliced orange sprikled with cinnamon is a common one. Riads used to be where all the super rich Moroccans lived, the buildings look like nothing from the outside (which helped not to attract thieves), but once you get inside they’re like fabulous little palaces, with a garden and water feature inside the building. The trademark arches, mosaic tiles colourful decor, lamps and lanterns…all make for a very unique atmosphere. When we arrived, a waiter came and wrote out our names on the table with sequins…one sequin at a time – and he did it perfectly (that’s a new one), and then we were presented with a large silver bowl and asked to hold out our hands while water was poured from a large silver teapot to rinse our hands before we ate. After dinner, we were asked to hold out our hands again while rose water was poured over them to freshen them up! “They are not plastic” said our guide as we got off the coach…..
As per with most things – the local people around the tree will want some money from you before you leave. Beautiful presentation of a wonderful and marvelous place, Cherryl. Thank you so much 🤗x It really is a marvellous place! Looks like a wonderful trip, but there is now way I could eat that food you talk about. Good gosh! 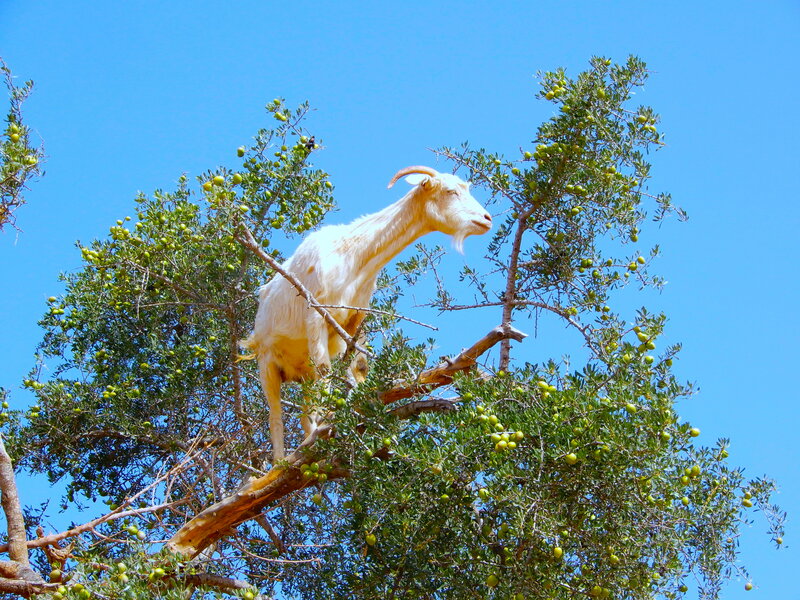 According to our guide in 2002, ‘genuine’ goats will move about from branch to branch. If they’re standing still, the herd-boys hoisted them up there to collect largesse from passing tourists. Also sounds like you had a very honest guide! !